Comprises of a proprietary blend that derives a bioactive complex rich Lactoferrin , Linumlife and zinc gluconate. 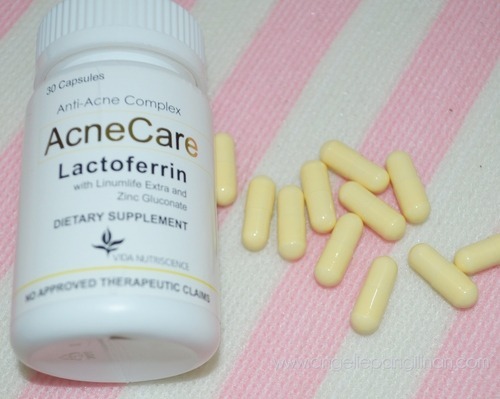 AcneCare is based on milk’s many bioactive components with specific physiological effects to support the reduction of blemishes and redness associated with a bad complexion. The most essential mechanisms are the anti-microbial, anti-oxidant and anti-inflammatory properties to help promote a healthy complexion from the inside. All you have to do is to take two capsules a day. One in the morning and one in the evening. That’s what I really did because I really wanted to get rid of my pimples. Haha! I usually get pimples when my monthly period is nearing. Who doesn’t hate pimples? They lowers almost all girls’ self-esteem. And since I only finished the three bottles sent to me, I’m planning to repurchase real soon. Yes, because I truly believe in this product, it works really great! 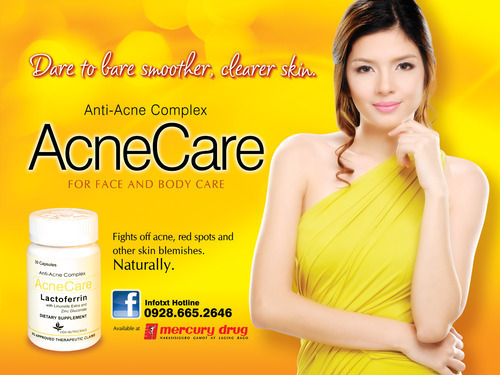 I’m glad that it is available on all Watsons and Mercury drug stores. So convenient! all mercury drug stores here in tarlac and the 1 watson's in SM tarlac, doesn't have any stock of this. they have it in their records, but they don't really sell it functionally. You have to order from them which will take 2 weeks!… I guess this product is only readily available in Manila area. Rubish! Avaiable kaya to sa davao? Pwede po ba ito for male? 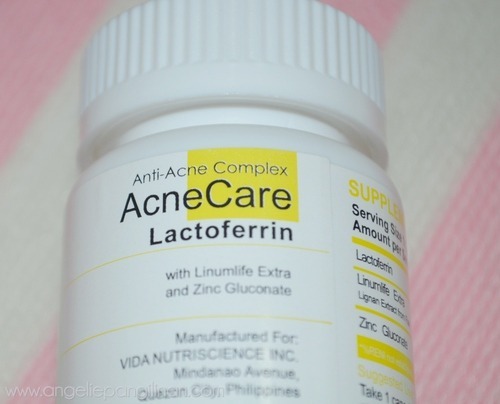 Nabasa ko kasi sa isang blog it helps reduce the amount of male hormones. Tama po ba? Pwede kayang magtake din kami na lalake? Pwede po ba ito for men? 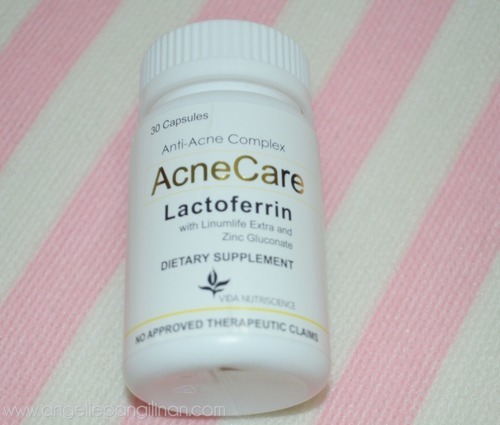 Nabasa ko kasi it helps reduce the amount male hormones sa isang blog/review. Tama po ba? ive tried it almost for 2 months. yes it works! but i noticed that i havent had a proper period of some sort like i haven't had a full all out blood flowing kinda thing. i just had little blood coming out and just lasts for a day that's why i got scared and stopped taking it. 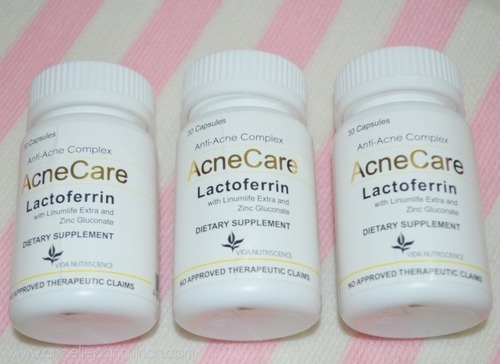 Effective ba talaga xa for oily face, acne and pimple marks? Bat ung nabibili sa lazada kulay white ung capsule.. nu ba talga kulay ng original ? This is an orginal product. 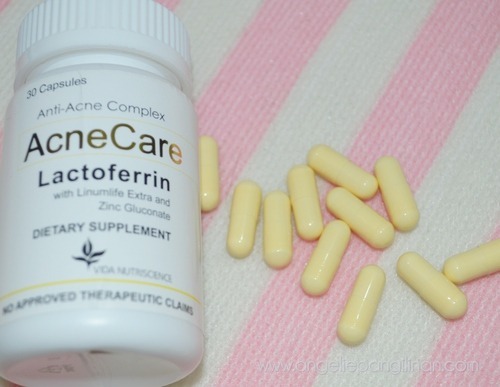 This was sent to be by the AcneCare Company itself. Ooh. You should probably ask your doctor about it. About 900php per bottle. I think?